This video is not a guided walk but of some of the wild and domestic animals that we have seen and captured on video whilst out walking. Most of the shots are in our videos on the website and YouTube, the rest are shots that we have captured on local walks and are not on our website videos. For more animals on film please watch our other videos. Below is a list of the animals in order of appearance and where they were captured in our videos or whilst out on local walks. Shrew: in the Somerset Country Walk – Somerset Levels – Glastonbury Abbey to Glastonbury Tor video. Squirrels: in the North Wales Country Walk – Bala Lake to Llanuwchllyn video (part 1). Highland red cattle: in the North Yorkshire Country Walk – Thornton-le-Dale to Dalby Forest Visitors Centre video. Stoat: in the North Yorkshire Country Walk – Sinnington to Cropton video. Lambs: in the North Yorkshire Country Walk – Masham – River Ure – Marfield Wetlands video. 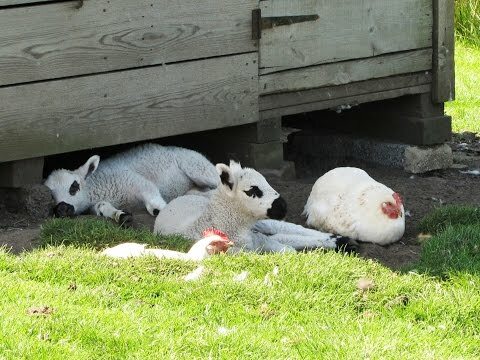 Lambs and chickens: in the North Yorkshire Country Walk – Pateley Bridge to Ashfoldside Beck video. Badger: in the North Yorkshire Drax Skylark Centre and Nature Reserve video. Rams: in the North Yorkshire Country Walks – Summerbridge to Darley video. Lambs: in the North Yorkshire Moors Country Walk – The Farndale Daffodil Walk video. Pigs: in the North Yorkshire Country Walk – Pateley Bridge to Ashfoldside Beck video. Rare breed pig: in Gloucestershire Country Walk – The Mousetrap Inn to the Slaughters and the River Windrush video. Lambs: in the Yorkshire Dales Country Walk – Cover Bridge – Jervaulx Abbey -Thornton Steward video. Fox: in the Constable Country Walk – John Constable and the Essex Fox – Dedham – Flatford – Cattawade video. Ponies: in the New Forest Country Walk – Fordingbridge – Woodgreen – Hale – Godshill video. Goats: in the Somerset Country Walk – Cheddar Gorge video. Hedgehog: in the Yorkshire Dales Country Walk – Grassington – Hebden – Grassington Moor video. White and black horse: in the Teasdale Country Walk – High Force and Low Force – Middleton in Teasdale video. Black rabbit: in the Teasdale Country Walk – High Force and Low Force – Middleton in Teasdale video. Bull: in the Sussex Country Walks – Eastbourne-Birling Gap – Beachy Head video. Squirrel: in the Lake District Cumbria Country Walk – Arnside – Arnside Knott – River Kent video. Hare: in the Lake District Cumbria Country Walk – Lacy’s Caves and Long Meg Stone Circle video. Dog: in the Kent Country Walk – Detling – North Downs Way – Pilgrim’s Way – Thurnham. Deer: in the New Forest Country Walks – Brockenhurst – Rhinefield – Brock Hill – Bolderford Bridge video. Deer: in the New Forest Country Walk – Acres Down to Bolderwood Deer Sanctuary video. Pigs: in the New Forest Country Walk – Acres Down to Bolderwood Deer Sanctuary video. Mouse we saw at Skipwith Common between York and Selby in North Yorkshire. Not in our videos. Lame Deer we saw at Wass near Hemsley. Not in our videos. Longhorn Cattle we saw at Skipwith Common between York and Selby in North Yorkshire. Not in our videos. Hares we saw at Grimthorpe Woods, Givendale near Stamford Bridge in North Yorkshire. Not in our videos. Mouse we saw at Wheldrake Inngs near York in North Yorkshire. Not in our videos. Performing Bear: in the Somerset Country Walk – Somerset Levels – Glastonbury Abbey to Glastonbury Tor video.